Hope you all are enjoying this amazing weather we have! My husband is here in town for our last weekend in Fennville before we move in April. We plan to go to the beach and have some fun. 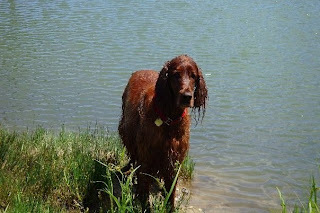 Also, Happy St. Patrick's Day from me and my favorite Irish friends...my mom's Irish Setters! Happy St. Patrick's Day to you too! !